Values are often referenced alongside the notion of building resilience and yet, like values, the idea of building resilience is not consistently understood. Lifeworlds have teamed up with British Red Cross (for whom 'building resilience' is key to their mission) to explore resilience in learning and we expect this work to make a significant contribution to Learning Through Values. 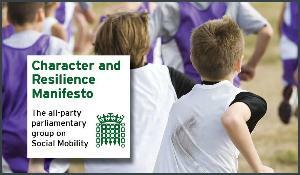 A report from the All Party Parliamentary Group on Social Mobility - The Character and Resilience Manifesto makes interesting and at times controversial reading. It is a useful input to this project however and shows interest at high levels in government. You can access and download the manifesto and other related papers here.